There is no central bank that can control the issuance of bitcoins. Anyone can "mine" new bitcoins by dedicating their computing power to solving complex tasks which help create the new bitcoins. The total number of coins that can be mined is also limited, so that bitcoins will hold their value similar to the way gold does; the bitcoin currency isn't open to continuous inflation (aka debasement) like other currencies. Bitcoins are generated via a complex algorithm that works towards solving a block, this process is known as "mining". Using a GPU instead of a CPU can be up to 100x faster at generating hashes. If you aren't using the right equipment, it can cost more in electricity to mine bitcoins than what the bitcoins are actually worth. You may be asking if simply running your computer to create money out of thin air is a scam, but they also create regular money out of thin air, and there is no end to how much they can inject into the economy - when ever they feel like it. It actually costs something to create new bitcoins and it's not an easy task. The most important aspect of any currency is that the units are rare, not like grains of sand on a beach. Fiat Government money is like sand, unlimited to those who control it. So when people tell you bitcoins are just these virtual things created from thin air, remind them that the money they use is no better than grains of sand on a beach. You can make a profit in mining bitcoins if you have the right set up, but the bitcoins will not come free. It's just like mining gold, which is also a limited quantity resource. You pay for all the mining equipment, and then expect to make a profit, like any business. 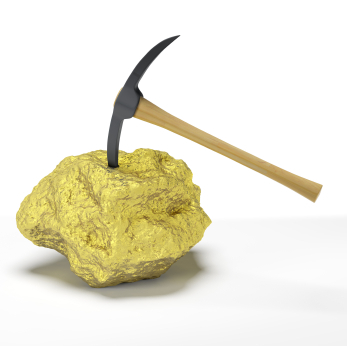 The difficulty of solving blocks will increase as the total number of people mining increases. The algorithm adjusts so that every 10 minutes a block will be solved, the reward is currently 25 bitcoins per block. The rewards for each solved block will halve over time, and it can already take a very long time to be rewarded when solo mining. Even with a decent system it may take you weeks or possibly months. When solo mining, the probability of winning a block reward is proportional to the amount of work you contributed to the block and how many people are mining. Therefore solo mining is mostly just luck of the draw and you wont win often unless you have a lot of specialized ASIC mining hardware. Solo mining doesn't provide a consistent flow of bitcoins and will probably waste your time and electricity. A more reliable option is pooled mining, where you work with multiple clients and share the rewards from blocks based on what each miner contributed, and a small amount goes to the pool operator (often optional). This method gives you a steady income of bitcoins in smaller amounts over shorter periods of time. Deepbit and BTC Guild are popular bitcoin pools with cleanly designed website interfaces. However, these centralized pools often pose a risk to the bitcoin network because they can represent a large portion of the total computing power of the bitcoin network. We now have decentralized pools which are much more aligned with the bitcoin spirit. For example P2Pool is a decentralized pool that works by creating a P2P network of miner nodes. These types of distributed pools help to create a more secure bitcoin network and we recommend their use.